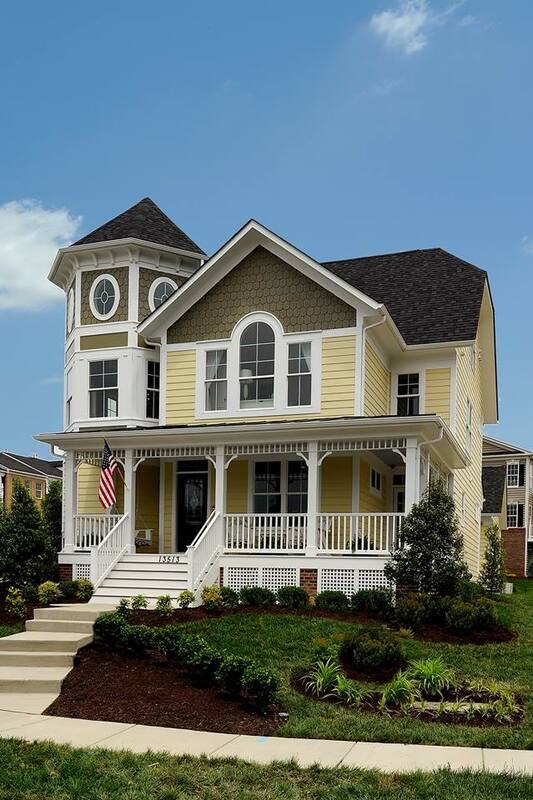 Victorian style meets modern flair in Branford Plan at Poplar Run, the 2014 Best in American Living “Gold Award” winner, Single Family Detached Home, 2,001-3,000 square feet, Built for Sale. In addition to the Branford’s sought-after bold exterior colors (for the hottest 2014 interior color, click here) and curb appeal, Poplar Run is one of the last new home communities in Silver Spring, Md. The welcoming neighborhood is a perfect juxtaposition between the popular downtown area, transit and green space: a former country club, Poplar Run has dedicated 70 of its 308 acres to the expansion of the Northwest Branch Stream Valley Park. Designed by architecture firm Bassenian Lagoni, the home’s must-have’s exceed buyer demands—especially based on our recent survey of men’s and women’s home feature preferences. Both genders prioritize items like outdoor living space, attractive master suites, garage, family interaction space and entertaining areas. And the Branford delivers. Beyond its traditional entry sequence, we find expansive views through the home and an open informal space perfect for family gatherings and entertaining. The home’s large great room opens to the rear yard and a kitchen nook that creates multiple uses within one space. The large master suite, two-car garage, ample storage space and true detailing meet both current and classic demands. Also, the oversized front porch invites outdoor living—one of our Awards’ notable design trends for 2013-2014. No longer limited to warm climates, these areas are popping up nationwide. Both production and custom homes have moveable glass walls, gourmet outdoor kitchens and interior courtyard pools, adding more everyday living space. For a closer look at the Branford’s design, check out our photo gallery.